HomeNewsPress ReleasesOh, What Fun It Is to Give a Manatee! Oh, What Fun It Is to Give a Manatee! Mom, Kelly Hasse, says her daughter Alex has been passionate about manatees and helping them since she was six. “Her passion has never faded,” says Kelly. 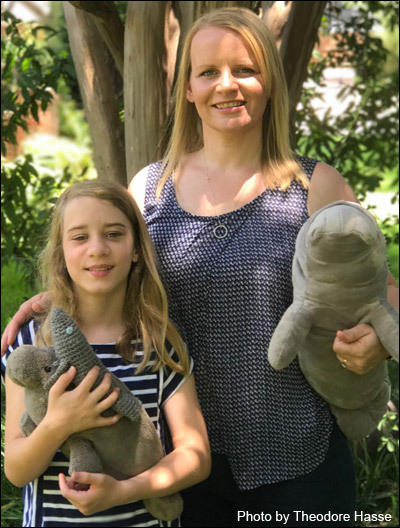 Note: A high resolution jpeg (300 dpi) of a manatee image, as well as a photo of Kelly Hasse and her daughter Alex, are available upon request. Spread some holiday cheer by giving considerate, animal-loving gifts this year. Green things up and Adopt-A-Manatee® from Save the Manatee Club. Unlike most other animal adoption programs, the manatees in the Club’s adoption programs are real, living manatees with known histories. For the past 36 years, Save the Manatee Club, an international 501(c)(3) nonprofit, has educated millions around the world about imperiled manatees and the threats to their long-term survival. 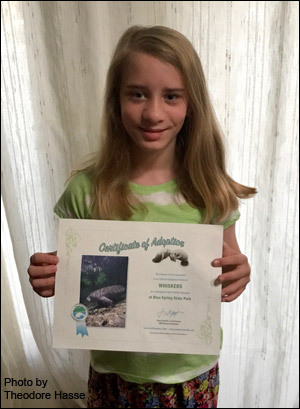 Through the adoption program, many more are learning about manatees, compassion for animals, and stewardship. Alex proudly holds her “Whiskers” adoption certificate. “Whiskers just looked like he would be perfect for her,” says mom, Kelly, about choosing a manatee adoptee for her daughter last Christmas. Holiday shop for tax-deductible manatee gift adoptions and special gift items from the Club’s Manatee Store. To adopt, call toll free at 1-800-432-JOIN (5646), or by visiting our Adopt-A-Manatee page at the web site. Shop for treasured manatee gifts at your convenience online at shopsavethemanatee.org.